406'10" by 55'6" by 32'6"
The Nagoya Maru was completed in 1932 by Mitsubishi-Nagasaki as a passenger/cargo ship for the Nanyo Kaiun line and requisitioned in 1941 as a submarine tender. She was at Cam Ranh when war broke out. 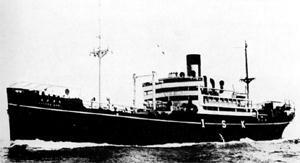 Reconfigured as an aircraft transport in 1942, she was torpedoed on 1 January 1944 by Herring off Aogashima.